The Rochester Conscious Capitalism Chapter invited Michelle Roberts, President and Branding & Marketing consultant to co-host and moderate a panel discussion highlighting three of Michelle’s working clients that are using purpose to create meaningful marketing messaging, purpose-driven culture and customer experiences that reinforce their brand. One of the four tenets of Conscious Capitalism is a higher purpose: Knowing WHY your business exists provides you with a compass to find and stay focused on achieving your higher purpose. 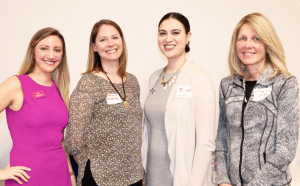 The three panelists were comprised of Deanna Spiotta, Communication Director for Health Baby Network, Dr. Mary Ann Lester, Periodontist and Owner of Perio Health Partners, and Melanie DellaPietra, Talent Development Consultant and owner of PeopleMinded. You might be wondering, what do a private practice owner and periodontist, talent development consultant and non-profit communications director have in common? They all value leading and contributing to a purpose-centric organization. No matter what size company or what type of industry you’re in, it’s no longer an option you must seek a higher purpose than profit, to play a larger role in consumers’ lives and in society as a whole. By aligning around a meaningful purpose, these organizations are best positioned to build a more emotional and lasting relationship with customers, hire and retain high-quality talent, and drive sustained growth — all while making a positive impact on the world. • In order to have success, you first need to know who you are as a leader, a team and a company. • Knowing which words to use in our communication with employees and clients was key to effectively marketing our organization and making the people we serve happy. • Everyone on our team felt empowered to live the brand because they were apart of the creation and involved in the process. • There is more to a brand than saying what you believe, it’s about aligning behaviors and empowering your people to live them – we did this with Michelle’s workshops and brand training programs. • Your brand purpose and message does not change depending on who you speak too, but your key messaging does. An authentic purpose, when developed well, will never change. • Measuring impact: Our success rate for our attendee events doubled due to our brand efforts. • Attracting the clients you want to starts with standing for something authentic and purposeful. The more you express what you stand for, the more you attract others who believe what you believe. Simon Sinek said the trick isn’t to do business with people who need what you buy but to do business with those who people who believe what you believe. It creates loyalty and lasting relationships. Michelle helps organizations discover their purposes, engage the employees through brand building workshops, streamline communication of the voice of the brand and customer experience touchpoints to narrow in on how to build better experiences by using the brand.